This page The Spirit of Montmartre: Cabarets, Humor and the Avant-Garde, 1875-1905 is part of the laughter series. The Spirit of Montmartre: Cabarets, Humor and the Avant-Garde, 1875-1905 is an art history book edited by Phillip Dennis Cate and Mary Shaw, published by Rutgers University Press in 1996. The book was published to accompany the exhibition at the Jane Voorhees Zimmerli Art Museum, Rutgers, The State University of New Jersey (March 24 - July 31, 1996). 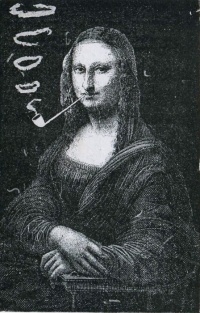 On the cover is Mona Lisa Smoking a Pipe (1883) by Eugène Bataille. Information about the men who created the images and the activities of the Le Chat Noir group as a whole is provided on pp. 1-94. A 19th-century work like Degas's The Curtain Falls hears a conceptual relation to this productive tradition of fumisterie; for when the curtain falls, the scene will be eliminated, the image reduced to its essence: color on a flat surface, a kind of Rothko or Barnett Newman before the fact, even if that color itself represents a thing, a curtain. It also has extensive documentation on monochrome paintings "Negroes Fighting in a Tunnel at Night" and other paintings from the Album primo-avrilesque. With the Chat Noir cabaret (1881-1897) and the Quat'z 'Arts cabaret (1893-1910) as its main focus, and concentrating on individuals who participated in the group activities of the Hydropathes (1878-1881) and the Incoherents (1882-1896), this collection of five essays documents and explores the development of the Montmartre cabaret from 1875 to 1905. Montmartre is revealed as the primary promoter, catalyst, and often, site for the collaboration of artists, writers, composers, and performers in the production of illustrated journals, books, dramatic pieces, music, puppet shows, and the protocinema invention of shadow theater. The contributors reveal the essence of Montmartre's artistic, intellectual environment and analyze its inextricable relations with an important, multidisciplinary body of avant-garde, fin-de-siecle art, literature, and music. The Spirit of Montmartre is the story of Paris's earliest, original, avant-garde groups - an essential part of the cultural context for Impressionist and Post-Impressionist painters and for such important writers and composers as Mallarme, Zola, Huysmans, Debussy and Satie. Relying on Rabelaisian humor, this ephemeral avant-garde group phenomenon anticipates twentieth-century Dada, Surrealism fluxus, and Performance Art. In addition to the editors, the contributors are Olga Anna Dull, Daniel Grojnowski, and Steven Moore Whiting. Unless indicated otherwise, the text in this article is either based on Wikipedia article "The Spirit of Montmartre: Cabarets, Humor and the Avant-Garde, 1875-1905" or another language Wikipedia page thereof used under the terms of the GNU Free Documentation License; or on original research by Jahsonic and friends. See Art and Popular Culture's copyright notice. This page was last modified 18:58, 20 May 2014.